That's cool! Could I see some drawings? Alien appearances is what I want to work on, so I'll probably start with that. Yeah, there will be more. I've just been swamped with job work. Thanks, It sounds like an issue with that graphics card. I've tested it out on an old laptop with older integrated graphics) and it works. Sorry. Maybe try making sure your drivers are up to date? Can you tell me the specs of your machine? I just uploaded a new build, hopefully it should fix the crash. Thanks! I'll hunt this down. Aww, now you're making me blush! 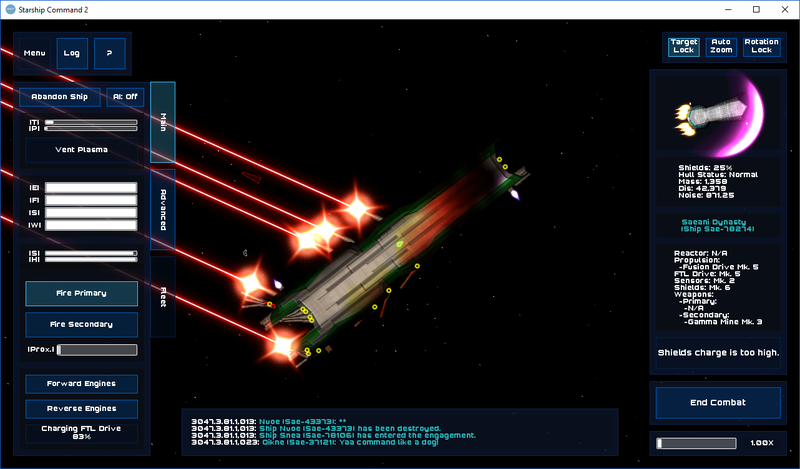 Starship Command 2 community » Support · Posted in Crash on "Clear"
Thanks, I'll hunt this down! For the separators, what language is your system on? And, I've been meaning to add in panning on the galaxy map, I'll bump it up the list! Thanks, did you ever get a new ship? or are you still in the escape pod? You can't get attacked if you are still flying around in the escape pod. You're welcome and thanks again for the bug report! They really help. Thanks for the bug report! I just pushed a new build that should fix it. Please let me know if it does or doesn't work! And I'm happy you're enjoying my game! Starship Command 2 community » Announcements · Created a new topic Beta-03 - November 22nd, 2017 - Nasty Bug Fix and Planet Surveys! New build (Beta 3) fixing nasty bug and planet surveys. I'm looking for any suggestions for weapon mods! Post them here and I'll get them worked out. New build introduces weapon mods! Jump Mines, Flak Bursts, Drones and more! Pulse Weapons have Flak, an explosive pulse that can also destroy warheads easier, and Shotgun, multiple pulses for the charge of one! Missiles have Cluster, which split into multiple warheads to avoid point defense, and Drone, which will circle your target and fire pulses at it. Mines have Field Emitter, which fires a field weapon when the target gets near them, and Jump which will try to "jump" close to the target instead of being stationary and waiting for the target to come to them. Starship Command 2 community » Announcements · Created a new topic New Announcement: First Beta Build! Thanks, but I don't want to trouble you. I'll just make a screenshot of them for reference. What happens to existing comments if I switch my game over to a discussion board? Starship Command 2 is a persistent-world, massively single-player, real-time tactical starship simulator wrapped in an AI-driven 4X game. Starting with a lowly shuttle, you will trade and battle your way to victory, amassing a gigantic fleet customized to your liking! In the game the first thing you do is setup a galaxy. Then SsC2 will populate it with AI-controlled empires that play their own 4X (eXplore, eXpand, eXploit, and eXterminate) game. You play as a captain for one of these empires by trading commodities, completing missions, collecting taxes from sectors and battle the other empires for glory! Massively single-player means that at any time you can switch between different captains of different empires in the same galaxy, playing both sides of a conflict. Hopefully, that's my plan. There should be no reason it shouldn't be able to work on Linux, I just haven't gotten around to it. I haven't given much thought about trying to get it up on Steam. Do you think it'd be important? Right now, to start a new game you need to go into the program directory and delete all the files (but NOT folders) in the "Data\Mods\Standard\Save" directory, or you could delete the entire save folder and add in the save folder "music", "images" and "images\hulls". If you want to setup a wiki for the game, that'd be great! You'd have my blessing. I don't have a way to set one up on my end right now. But if you do, you can see all the damage values, empire stats, etc. in the data folder. You're welcome! I appreciate the feedback. And again I'm happy to answer any questions about the game (And I'll probably start working a manual fairly soon). Thanks, I'll get this sorted out. And just so you know, this is a bug on my end, nothing with your computer! Yeah, if you could download it straight from the site and see if it saves that way, that'd be great. I always forget about the Itch app, I need to test it on my end. For the random closing, there should be a crash log in the games directory ( %APPDATA%\itch\apps\Starship Command 2\ for the Itch app) if there is one I could take a look at it. Also, there are some settings that could be changed in the settings file, lowering the max number of empires should help, and lowering the max hull size<- that actually could be the source of the closing, with SsC2 making an image too large for your memory. I could make a tweaked settings file for you, if you'd like. I haven't made a manual yet. I've been planning to, but just haven't gotten around to it yet. I'd be happy to answer any questions in the meantime though. And yes! All empires will expand on their own even if you do nothing. In fact, if you are the galaxy view, you can press the F5 button and toggle a "watcher mode" which will let you set the time rate to 5000x and watch the empires expand and fight. May I ask what kind of performance updates? I'm always trying to improve the performance, but if there is some specific areas that you noticed, It'd help to know. Lower "maxEffectsCount" and "maxEffectsCountHardLimit" to a lower number, the first is a soft limit where it will start to cull older particles faster, and the second is a hard limit that will remove the oldest particles over this number. Change "particleShader" to false, this and the "maxEffect"'s settings will give you the biggest improvement in performance. Those are the probably the best settings to change for increasing performance. Another tip would be to limit the size of your fleet, since SsC2 will try to match your fleet in strength, which can cause a massive battle of ships. I try to keep my fleet to ~20 ships, on my nine-year old Q9550. Thanks! Both crashes are probably related and I will have a fix out for it soon. Thanks. There should be a crash log in the game's directory. Could you either post it here or email it to me? It'd help trying to hunt down the bug. If you downloaded the game manually from the website the crash log will be in the root folder of wherever you extracted the zip. No tutorial yet, but it's planned. I can answer any question in the meantime. Yay! I'm glad that worked and thanks for the suggestion. It was an easy enough fix and I'll continue to improve it. Hey, I just whipped up a fix during breakfast. The new build (170527-0923) has an option in the settings file called "guiScale" that can be changed and it will resize the GUI accordingly. The GUI is currently built around a 1280x720 screen, so for a 4k monitor (3840x2160) the guiScale option can be changed to a 3 to fit. I haven't had the time to check it out very thoroughly (have to get to work) so there may be some small placement issues. :( Sorry that didn't work out! I might have another idea for a quick-fix I can get to later today. I'll look into it and let you know. It's a quick fix and probably won't look pretty, but it should get the job done until I put that feature in. I hope it helps! P.S. 4k! I haven't tried it on a monitor with that resolution! I'd love to know how it works! I just uploaded a new version that should log the reason for crashing. If you could try it and after a crash, post or email me the contents of %APPDATA%\itch\apps\Starship Command 2\crash.log I should be able to figure out why it's not working. Ohh! Thanks, I've never tried it through the itch.io app, maybe I can hunt down the crash through that. Hmm, thanks. That should be more than enough in specs. Can you tell me where the zip is extracted to? It may be a permissions issue or something similar. You could try extracting it straight to the C: drive and see if it works.